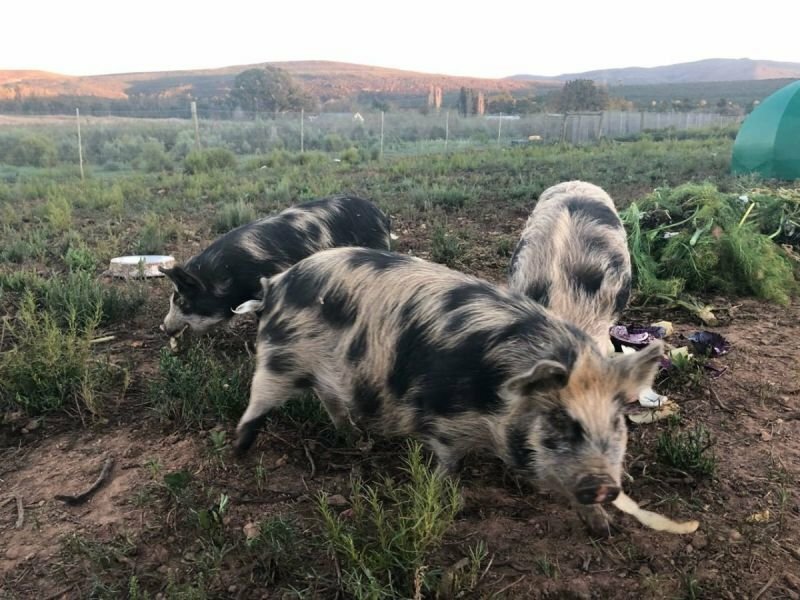 After experimenting with growing out a pair of Weaner Pigs in 2017/2018, and subsequently being subjected to a very steep but rewarding learning curve. We have decided to go the Whole Hog! We purchased our foundation Kolbroek stock in June 2018 from a breeder in Hartbeespoort (North West Province) who at the time also had available unrelated stock from a breeder in Howick (KwaZulu-Natal). And so was born Spotted Pig Kolbroek Stud. Subsequently we also brought stock in from a breeder in Bloemfontein (Orange Free State) and currently we are trying to secure and preserve bloodlines from around the Western Cape. The last official herd before ours having been kept at Elsenberg (University of Stellenbosch), which unfortunately have been dispersed. As with our Poultry one of our future goals and aspirations is to also move to a Non GMO diet. Currently this is just not possible purely due to economics of scale and availability. In short we are just too small to secure a bulk supply of Non GMO feed and none are available for small retail. This is a new venture for us and the learning curve still very much ongoing, if less steep. But of huge importance to us is Pig Welfare (Or the general lack thereof in Modern Intensive Units). A non-negotiable cornerstones of Compassionate Pig Farming and Pig Welfare to us is making use of an Outdoor Production Model. But this brings a whole set of management issues of its own. Chief amongst them will be dealing with Heat Stress and Sunburn seeing as it sometimes reaches up to 40°C in summer. Having a mud wallow in the middle of your planted grazing pasture is not exactly desireable. Therefore the only know variables at this stage is that we refuse to use crates for farrowing and the pigs will be kept and grown out on Pasture post weaning. We are still very unsure and undecided if we want to farrow on pasture or in smaller individual farrowing camps. Also due to our climate farrowing will have to be limited to Spring and Autumn. This page will be updated as we become more knowledgeable and learn from our mistakes. Because the only certainty that we have at this stage is that mistakes are inevitable! Its whether you learn from them that makes the difference.